A leader company in freshwater now enters the Saltwater Game! Uncompromised quality to affordable price, are the keys to success for this amazing brand. 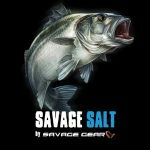 Innovation and ease of use, makes Savage Salt goods, ideal for every angler!